Tsukasa Mizugaki is our main character in Plastic Memories, who lands a role in the Terminal Service department at SAI Corporation after failing his college entrance exams. He is tasked to team up with an android called Isla, which are also known as Giftia, to recover other Giftias that are close to expiring (they have a shelf life of just over 9 years). It starts off with Tsukasa wondering about how he'd handle life if it was predetermined (wouldn't we all though?) whilst getting into an elevator. There he meets Isla shedding a tear, and thinks about how he might have fallen for her just in the moment. Then after brief introductions to his coworkers and job description, Tsukasa sets off on his first assignment. Set, in a futuristic Japan, you see how Giftias and humans coexist as an old couple tell their Giftia Eddie that he will always be their boy, before his program is terminated by Giftia Zack, and how an old woman refuses to give her child Giftia away. The upsetting thing is that the Giftia know what's happening to them when the retrieval team comes, and still smile whilst their owner(s) are sad to see part of their family go. The funny side to the anime is the fact that Isla is known as a veteran out on the field, but this proves to be anything but when it's time for Tsukasa and her to retrieve Giftias, and then tries to play out her mistakes as errors. But Tsukasa gets the blame for everything (poor guy). 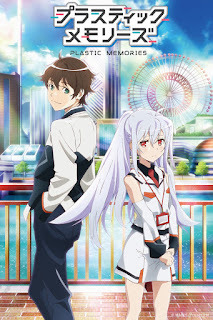 Plastic Memories is kind of steady paced with moments of comedy and drama, as Tsukasa tries to get along with Isla and the rest of the team and better at his job. Things do seem to be interesting in the episodes I have seen so far, and hopefully will continue to be as the show progresses.